University of Ottawa alumni are changing the world through their professional contributions and dedication to their communities. The uOttawa Alumni Association recognizes the outstanding achievements of its members with the annual presentation of the Alumni Association Awards of Excellence. Established in 2011, these awards aim to recognize the inspiring talent, effort and influence of the University’s graduates—locally and worldwide. A special night is set aside each year to bring together University supporters in celebration of our alumni achievements. List of past winners: 2012, 2013, 2014, 2015, 2016 , 2017 and 2018. Established in 1991, this is the Association’s oldest and highest honour. This award recognizes the inspiring talent, effort and influence of the University’s graduates. Past winners include television personality Alex Trebek, pianist Angela Hewitt, businessman Paul Tellier and journalist Lisa LaFlamme. Nominees must have distinguished themselves through excellence and achievement in their professional field throughout their career; have demonstrated leadership in their profession; have made a positive contribution to the prestige, influence and reputation of the University of Ottawa; and have exercised and continue to exercise a strong positive influence in the community. The Alumnus/Alumna of the Year Award recognizes the outstanding achievement of one of our alumni members within the last year. Consideration is given to alumni who have won honours in their field or who have been recognized nationally or internationally. This award recognizes an extraordinary alumnus/alumna who has set a high standard for volunteerism at and/or philanthropy towards the University. 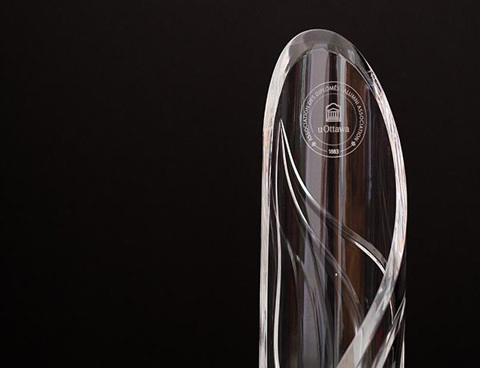 Specifically, this award recognizes individuals who have made significant contributions to the advancement of uOttawa through their dedication, generosity and commitment to its values. The Young Alumni Award recognizes significant contributions by an individual in his or her field, whether through professional achievement or community service. The winner must be 40 or under and set an inspirational example for future alumni. Presented jointly with the Michaëlle Jean Centre for Global and Community Engagement, this award recognizes alumni who have made outstanding volunteer contributions in their community. They have enriched the lives of others through their generous gifts of time and talent and through their involvement with civic, charitable and social causes. This award celebrates a person who is not a graduate of the University, but whose actions and dedication have affected the uOttawa experience. The award recognizes friends of uOttawa for outstanding personal service, commitment and contribution, past or present, to the University. Please note that awards are not necessarily presented in all categories each year. • With the exception of the Honorary Member of the Alumni Association award, nominees must be University of Ottawa graduates. • Graduates of diploma and certificate programs are also eligible. • Posthumous nominations are not accepted. • Nominations for sitting politicians are not accepted. Recipients of University of Ottawa honorary degrees are not eligible unless they also hold a degree obtained through academic studies. • Current members of the Alumni Association Board of Directors or the uOttawa Board of Governors are not eligible. The University of Ottawa Alumni Association secretariat administers the Alumni Association Awards of Excellence. Announcements inviting nominations are communicated electronically to all alumni reachable by e-mail and through our website. Selection is based on the nominee’s accomplishments. The Board strives for diversity among award recipients. The letters of support, biography and list of accomplishments should clearly make the link between the nominee and the award for which he or she is being considered. Please note: You cannot nominate yourself. The nominee should be advised and be given the opportunity to assist with the nomination package. You can only nominate a candidate for one award. Recipients are expected to attend the awards evening to accept their prize. Successful nominees agree to participate in publicity efforts surrounding the awards, which may include a videotaped interview, a photo shoot and interviews for alumni publications and news media.